Market flow attempts to model the institutional order flows in the forex market. The Market flow indicator monitors multi-timeframe fractals and determines where price action is in relation to the specific fractals. 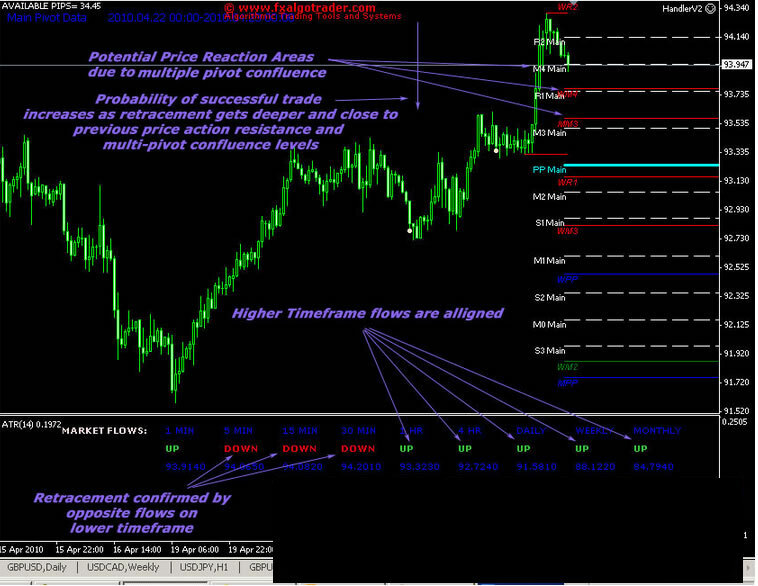 If price action breaks through a previous support level, market flow on this timeframe is deemed to be down. 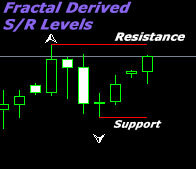 Conversely, where price action breaks through a level of resistance - the flow on this timeframe is deemed to be up. Flow traders look for an allignment of flows on their preferred trading timeframe and also supporting higher timeframes as well. 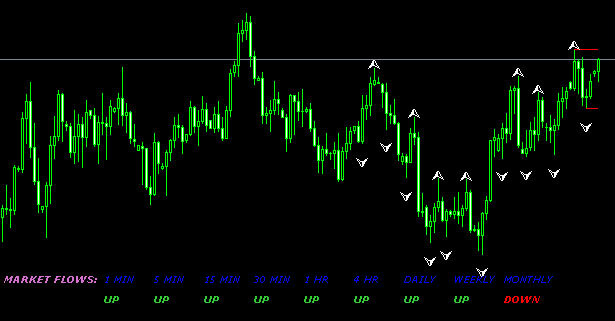 For example a flow trader may typically trade off an hourly chart. With this in mind they may look for flows on the 30 minute, 60 minute and four hourly chart to all be alligned. One of the most important aspects of forex trading is determining market direction prior to entering a trade. Advanced forex traders often use multi timeframe forex market flow data in order to determine which forex currency pairs exhibit the strongest directional flow. After all "The trend is your friend". 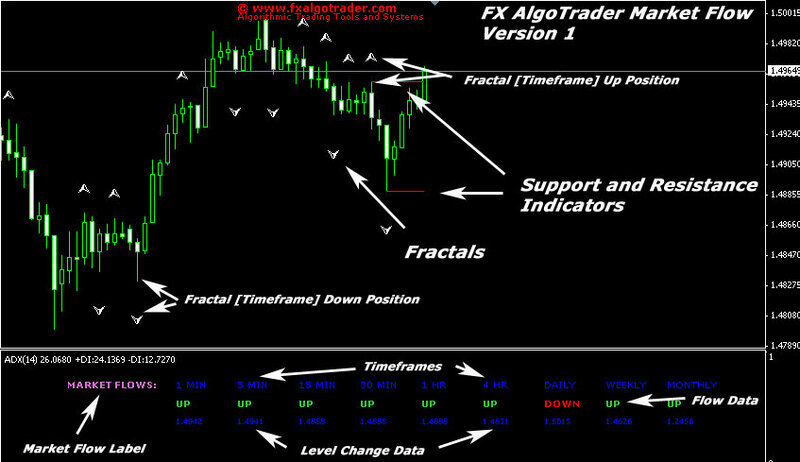 The FX AlgoTrader Market Flow JFX indicator uses fractal based support and resistance levels to calculate real-time multi-timeframe forex market flow data. The flow data is then displayed at the top of the main chart window. Using price derived support and resistance data to derive market flow is extremely powerful as there is no lagging effect introduced by indicators which attempt to predict future price action based on historical data. 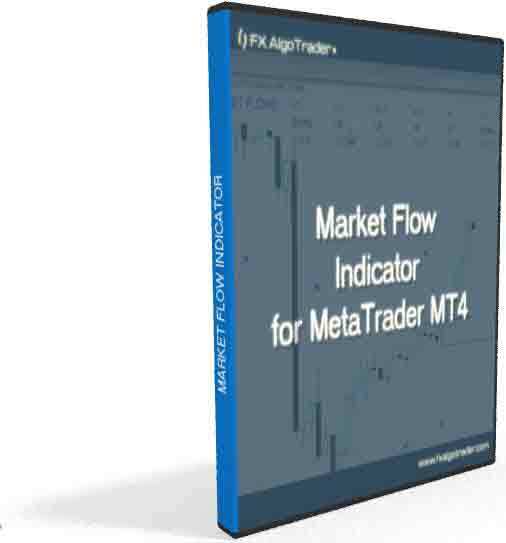 Traders who use market flow will normally only trade pairs which display 'alligned' flows. This is where the market flow is in the same direction over several timeframes. Clearly the larger the chart period the more significant the flow data becomes. For example if a forex pair had alligned market flows on the hourly, 4 hourly and Daily charts this would indicate a fairly strong trend is in place. The new JavaFX inteface version of the Market Flow indicator now allows traders to define an 'alert mask' so that the trader receives an alert when the market flows match the trader's flow mask pattern. 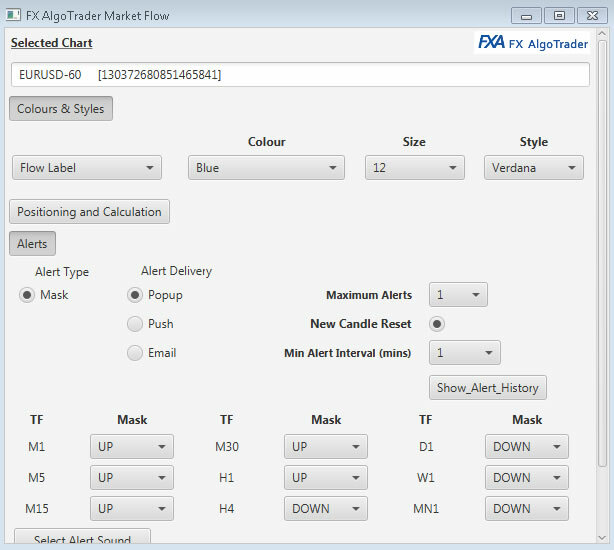 The alert masks allow traders to identify dip buying and rally selling opportunities in trending markets. 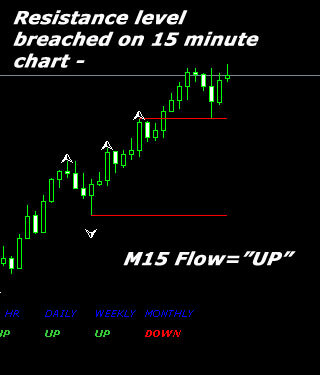 Market Flow on 15 minute chart - upper resistance level has been breached - therefore flow is "UP"
When the market flows are alligned on the higher timeframes the probability for a trade in the direction of the flows has a higher outcome of success. Market flow is best used in conjunction with other support and resistance based indicators such as trendlines, multi timeframe pivots, traditional support and resisance tools and MACD for divergence checks.